World Wide Web software development is a challenge. The need to provide appealing and attractive user interfaces is combined with the fact that the World Wide Web is not merely an information transfer tool anymore. The capacity to offer additional services plays an important role. The World Wide Web makes these services available to a greater number of individuals who have different characteristics, knowledge and profiles. The World Wide Web demands quick development with high quality level. This chapter makes an important contribution in the field of software product characterization for the World Wide Web, proposing a quality model that focuses on quality in use or usability. Said quality model, which has been partially tested on real users through several experiments, is based on international standards and ergonomic criteria. The model has proved useful for organizing and applying the experience available in the development of user interfaces for Web applications and has improved noticeably its final quality in use. Usability: Usability is the effectiveness, efficiency and satisfaction with which specified users achieve specified goals in particular environments (process-oriented definition). Usability is the capability of the software product to be understood, learned, used and attractive to the user, when used under specified conditions (product-oriented definition). User Interface: The user interface (UI) is everything designed into an information device with which a human being may interact and how an application program or a Web site invites interaction and responds to it. Quality Model: A quality model specifies which properties are important for an artefact (e.g., its usability, its performance, its visibility) and how these properties are to be determined. Quality: Quality is the totality of characteristics of an entity that bears on its ability to satisfy stated and implied needs. Web Quality Model: A Web quality model is essentially a set of criteria that are used to determine if a Web site reaches certain levels of quality. 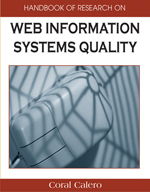 Web quality models require also ways to assess if such criteria hold for a Web site. Quality in Use: The capability of the software product to enable specified users to achieve specified goals with effectiveness, productivity, safety and satisfaction in specified contexts of use. User-Centered Design: User-centered design (UCD) is a highly structured, comprehensive product development methodology driven by: clearly specified, task-oriented business objectives, and recognition of user needs, limitations and preferences.